A personal biography through song with Scott Michelsen, piano. Join Bend Camerata for an evening of singing and celebrating choral music, Admission is free, November 14th at 7pm at the Bend Senior High Auditorium. Central Oregon's premier vocal ensemble will present songs and stories from an Irish House Concert. Christmas Concert at the Tower Theatre, Saturday, December 3rd, 2016 at 7pm. Join Bend Camerata for an evening of singing and celebrating choral music, Admission is free, November 15th at 6:30pm at the Bend Senior High Auditorium. Sing Joyfully: Bend Camerata in concert June 5, 2016. 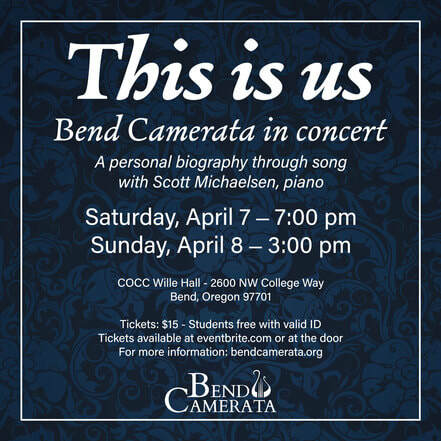 Bend Camerata, Central Oregon’s premier vocal ensemble, will present its debut concert at Bend Church (First United Methodist Church, 680 NW Bond Street). The concert will take place on Sunday June 5, 2016 at 3:00 pm. Admission is free; donations are graciously accepted. Featuring music throughout the eras, Bend Camerata will showcase an outstanding versatility of styles from Renaissance to new compositions. This concert will feature a world premier of "Alleluia" by James Knox (Music Professor at COCC) and other works by Monteverdi, Mozart, Vaughan Williams, Brahms, and Whitacre. We will also collaborate with local pianists Stephanie King and Julie Geveshausen. Comprised of local music professionals, Bend Camerata brings performance excellence through innovative programming and collaboration. Ash Wednesday Service at the Nativity Lutheran Church, Wednesday at 6:00pm. Community involvement concert with the Kids Choir Festival in Bend, Oregon featuring Bend Camerata at the Bend Senior High auditorium at 3:30pm. 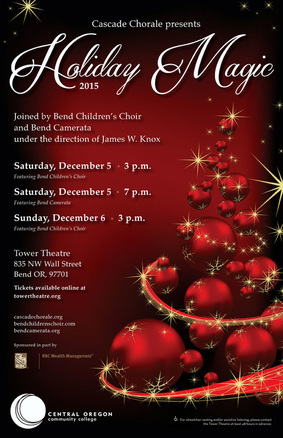 Christmas Concert at the Tower Theatre, Saturday December 5th, 2015 at 7pm. Bend Camerata and the Central Oregon Symphony will be performing chamber music together Sunday, November 15th, 2015 at 2pm. The performance will be held at Bend Senior High School Auditorium. The Music Ministry of Nativity Lutheran Church presents "I'm Gonna Sing! ", an evening of favorite songs and hymns. The concert will be held Sunday, June 6th, 2015 at 6pm located at the Nativity Lutheran Church.